I love cheese. It’s my favorite food. I like any kind of cheese, though goat cheese is a top choice. If you remember, earlier in the year, I experimented with making my own. I did buy it for this recipe. I love strawberries. Well, do you know anyone who doesn’t love strawberries. They cry out “Summer is here!” They aren’t quite in season locally, but soon. I love bread, especially crusty artisan bread, but any bread. I learned about bread eating from my dad. He always said I would make a good prisoner because I am often content eating good bread and drinking water. This week’s recipe for French Fridays with Dorie was another “whisper” of a recipe, but these three key ingredients. Goat Cheese and Strawberry Tartine says it all. 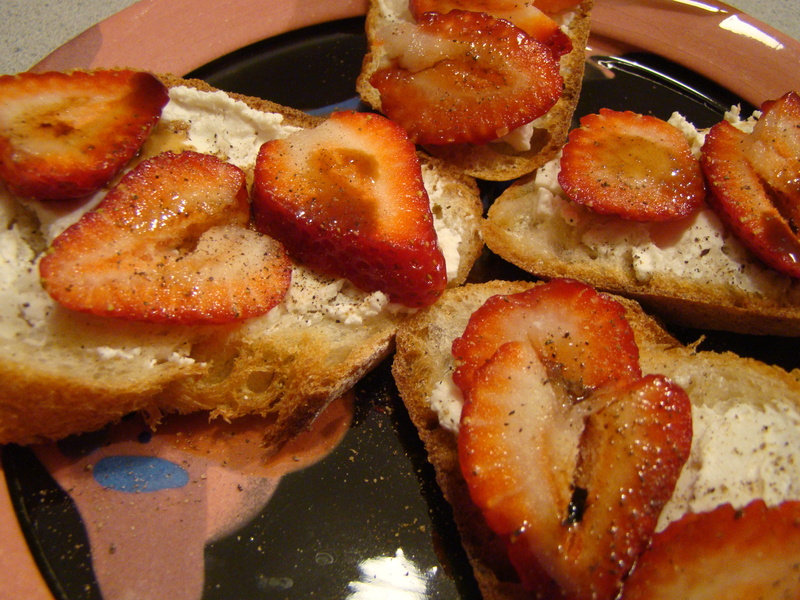 An open-faced sandwich: crusty bread spread with goat cheese, topped with sliced strawberries, drizzled with balsamic vinegar and sprinkled with freshly ground black pepper. I made the recipe twice this week. The first time, I made the tartine with big diagonal slices of a crusty baguette. I ate a plateful of tartine as a light supper. It was over 90 degrees out, so with no cooking required was perfect. With a glass of cold white wine, this fit the bill. 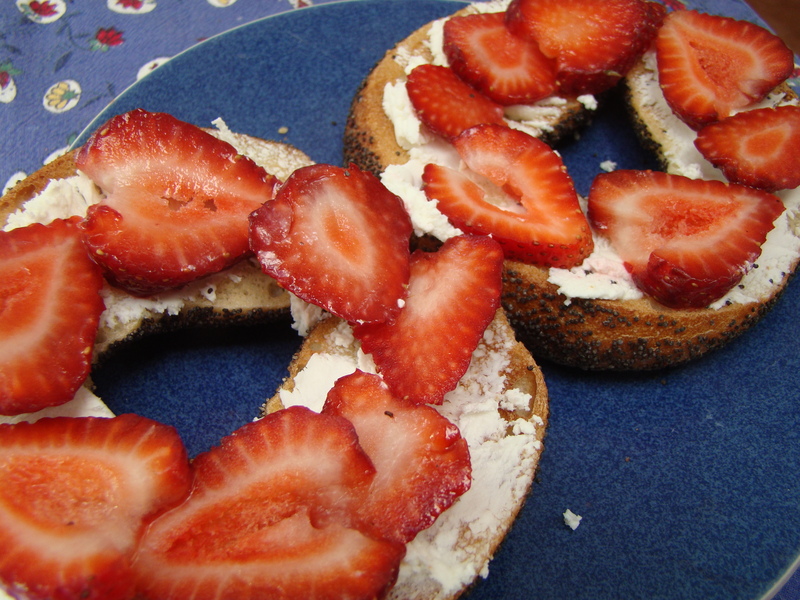 The second time, I topped a toasted poppy seed bagel with goat cheese and strawberries, thought I left off the pepper and vinegar because it was morning. It brought together all the necessary breakfast food groups: bread, cheese, and fruit. This was so simple, but so good. I think I’ll enjoy this combination again when the strawberries are at their peak, especially for breakfast. I won’t even bother to find a link for the recipe because it’s self-explanatory. If you want to read about other Doristas’ tartines, check their links here. I have a thing for goats. I’ve adored them for years. In my dreams, I’d like to have a small herd someday, but, realistically, that just isn’t going to happen. I love goat cheese too. It’s more realistic for me to try my hand at homemade goat cheese. 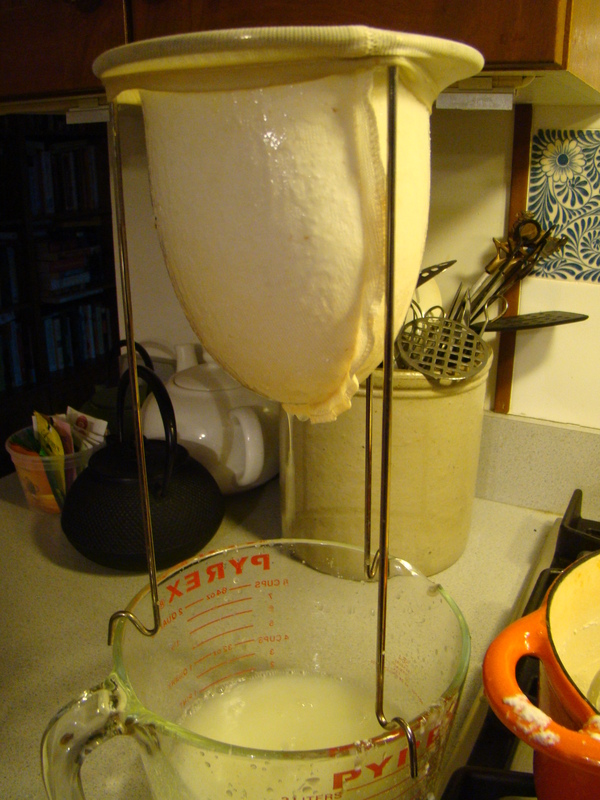 I took a goat cheesemaking class in September 2011, but after I ordered the cultures, I felt intimidated and procrastinated on trying it myself. Recently, I took another class on making fresh cheeses. We learned to make ricotta and paneer from cow’s milk and chèvre from goat’s. 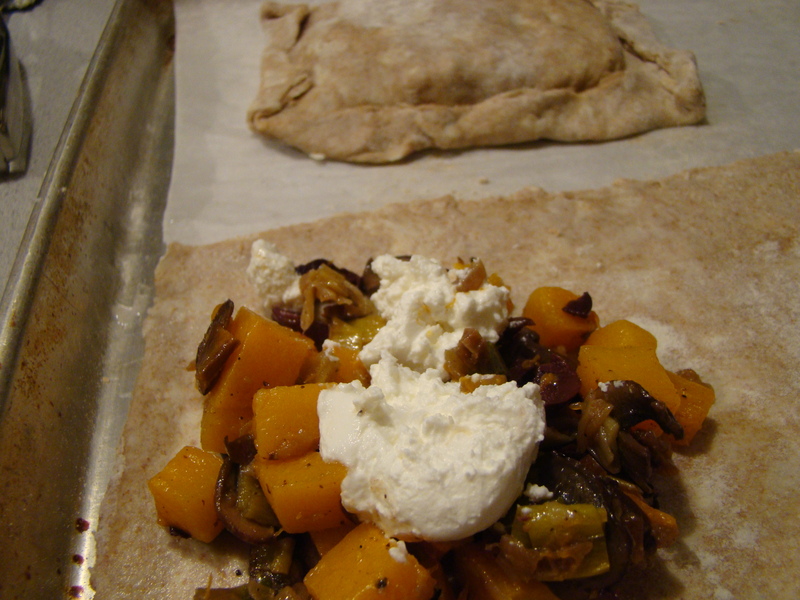 The goat cheese recipe was simpler than the original one I learned. I still had the original cultures in the freezer, so I took immediate action. I don’t have access to raw goat’s milk, but Whole Foods sells goat’s milk that isn’t ultra-pasteurized. 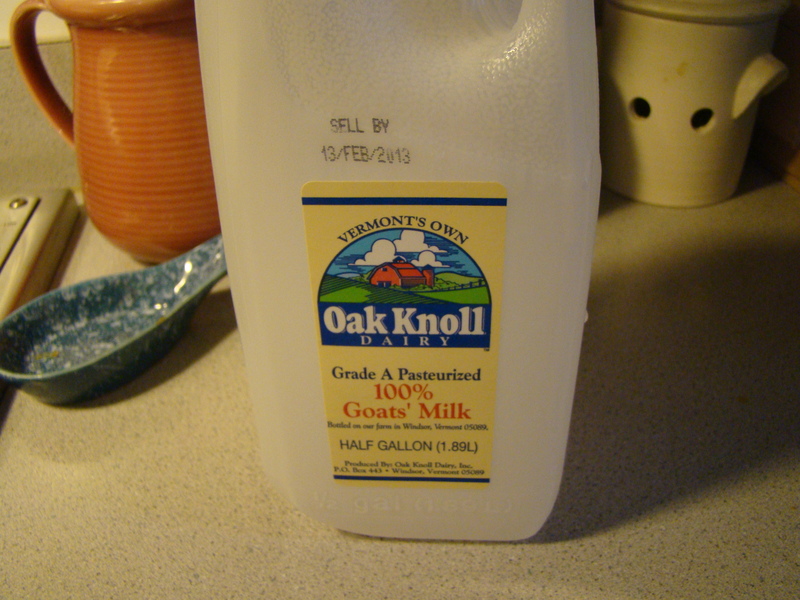 Interestingly, I read in the local paper that Oak Knoll Dairy has a Lexington connection. 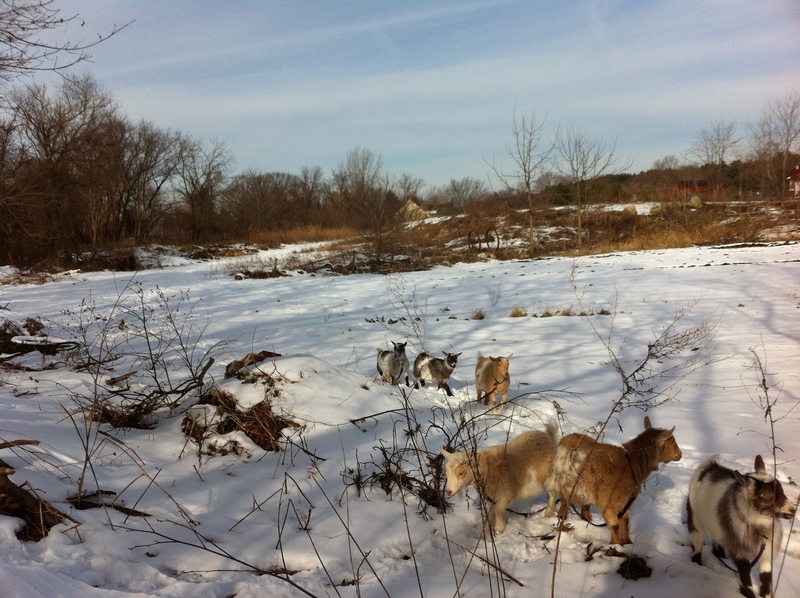 The owners used to live on a small farm just across town, Oak Knoll Farm, with blueberry fields open for pick-you-own. Apparently, they started to raise goats and eventually moved to Vermont where they now have a Grade A commercial goat dairy. Here’s how easy it is. The milk is heated up to the right temperature. I mixed in some direct-set culture for goat cheese. I covered the pot and let it sit on the stovetop for 24 hours until the curds set. Then, I ladled the cheese into a strainer (I used a fine-meshed jelly bag) to allow the whey to drip out for 12 hours, and it was chèvre. 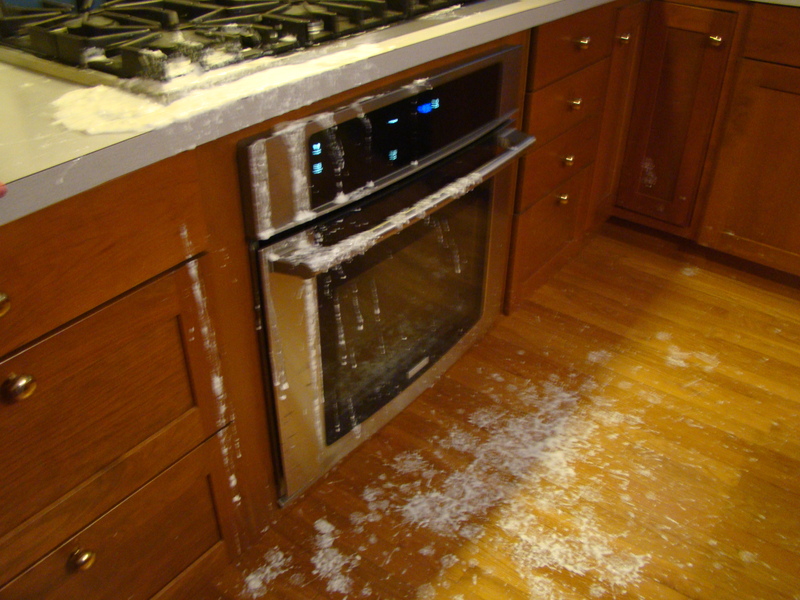 I started with a half-gallon of goat’s milk and, in the end, accident included, the chèvre filled a 10-ounce container. If it hadn’t spilled, there should have been about a pound. 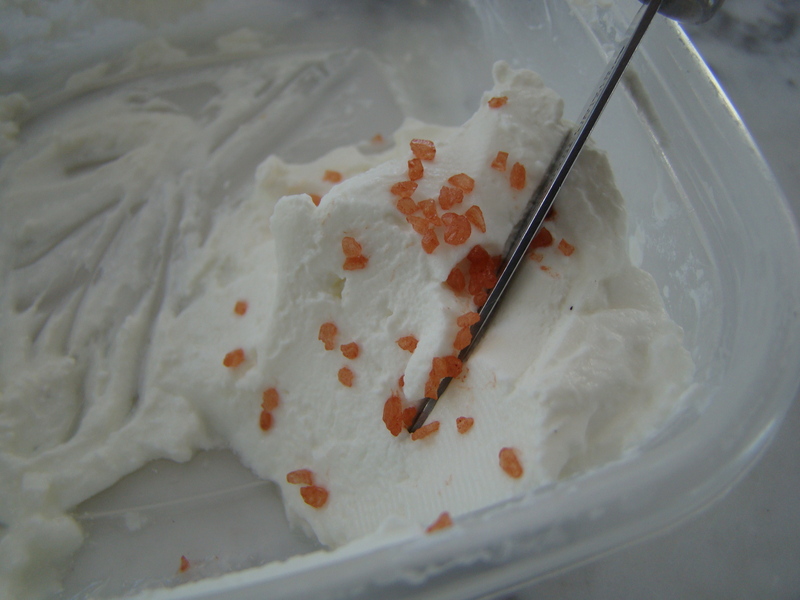 The soft fresh cheese was delicious spread on toast and topped with a sprinkle of coarse salt. 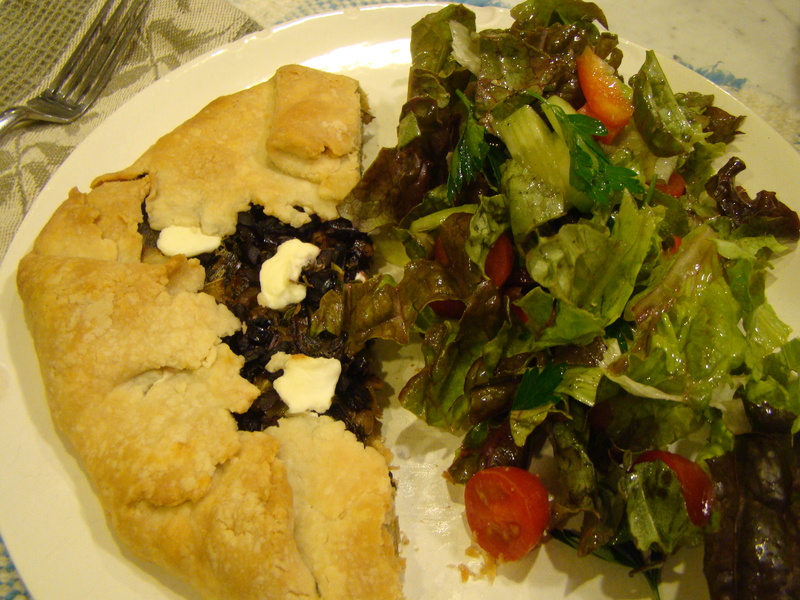 I also dabbed the goat cheese on top of a galette. You can substitute the whey for milk when baking, so my Super Bowl cornbread and some not-so-successful buckwheat popovers had some added tang from goat milk whey. My first batch is gone, but I plan to make more this week, without spillage, I hope. Heat milk to 86F. Stir in one packet starter bacteria. 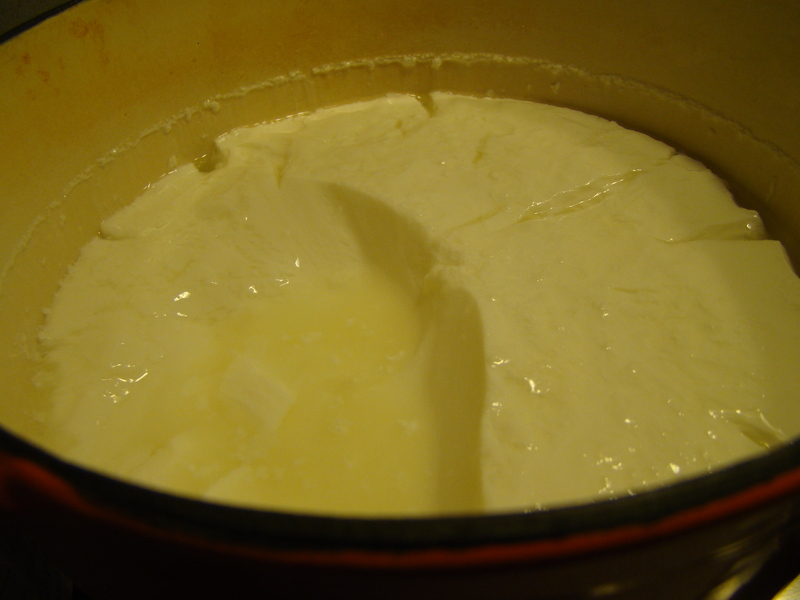 Cover and leave at room temperature, undisturbed, for 12 to 24 hours, until curds are set. Ladle curd gently into a jelly bag or butter muslin-lined strainer set over a bowl large enough to catch whey. Let it hang to drain for 6 to 12 hours. Can be salted to taste with an uniodized salt, like kosher or sea salt. The recipe can be halved (that’s what I did).